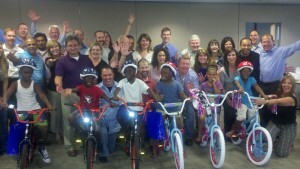 Direct Energy of Tulsa, Oklahoma hosted a Build-a-Bike event in their new facility on S Yale Ave with 30 team leaders. Many of the participants commute from Houston & Dallas to Tulsa, so Linda Coleman of Direct Energy was looking for an event to help collaborate and bring everyone together on the same page. The event helped everyone appreciate each others strengths and working together you can achieve more or just different results. This group was very competitive, in the cheer activity some teams actually inserted flips & acrobatic moves. The group was amazed when the kids actually showed up to receive the bikes, many of them didn’t know until that moment that the kids would be attending the event. Each group was able to deliver a completed bike to an individual kids and see the smile on that kid’s face! The pride in the groups as they took pictures,exchanged names with the child that they built that bike for. Direct Energy is the largest competitive retailer of energy and related services in North America, so they also wanted to be able to give something back to their community. We worked closely with Youth at Heart Charity in Tulsa to provide children with new bikes, their first bike in many cases. At the end of the event as the children rode around the room on their new bikes, the COO Dennis Weikle stood and clapped and said “this is great”.